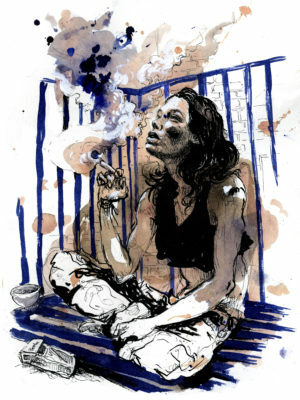 This is a signed limited edition of 25 giclee print of Portrait of Stoya, a featured image from Molly Crabapple's memoir, Drawing Blood. I hate the word muse, but Stoya was mine. I drew her over and over. …I loved drawing her hard stomach and her shoulders, so thin that every detail of muscle stood out. Her narrow eyes were skeptical against the mathematical beauty of her face. …[She] spoke in a girlish whisper that made her contempt for idiots sting harder.